INDIANAPOLIS — The shot came from NBA range, and if things play out as expected, Aaron Harrison and a lot of those Kentucky kids will be playing in that league soon enough. First, they’re heading to the Final Four – a trip to Big D courtesy of Harrison’s unforgettable big shot. The 6-foot-6 forward made a three-pointer from about 24 feet with 2.3 seconds left Sunday to lift the Wildcats and all those freshmen to a 75-72 win over Michigan and the program’s 16th trip to the Final Four. He backpedaled slowly, almost expressionless, after ball hit twine. Teammates Dakari Johnson and Julius Randle chased him down. “Making that shot and seeing my teammates so happy and turning toward me, it’s the best feeling in the world,” Harrison said. Michigan’s Nik Stauskas missed a desperation heave at the buzzer and then, it was Harrison’s turn on the bottom of a dog pile. Make that a puppy pile. Eighth-seeded Kentucky is the first all-freshman starting lineup to make the Final Four since the Fab Five at Michigan in 1992. The Wildcats (28-10) will play Wisconsin next Saturday outside of Dallas at AT&T Stadium. The Wolverines (28-9) ended their season one win shy of a second straight Final Four. What a ride this has been for this group of Wildcats, an all-new collection of McDonald’s All-Americans who were touted as the team that could go 40-0, then dismissed out of hand when the bad losses and bad basketball piled up in January and February. Coach John Calipari got things turned around by March, and for the second straight game in the Midwest Regional, Harrison made the shot that gave the Wildcats the lead for good. On Friday, he made the key three in Kentucky’s 74-69 win over Louisville. Kentucky is the first team to knock the defending champion and runner-up out of the same tournament. For this game-winner, Harrison took a handoff from his twin brother, Andrew, in the corner and dribbled three times to the top left of the arc. He was standing a good three feet behind the line when he elevated over Caris LeVert and took a bit of contact on the hand from the Michigan guard as he shot. No matter. The ball rattled in. Aaron Harrison scored 12 points off four three-pointers over the last 8:05 and was Calipari’s obvious choice to take the game-winner. It wasn’t all Harrison, of course. While he was being shut down early, it was Marcus Lee – surprisingly – keeping the Wildcats in the game. Lee, another of the McDonald’s All-American freshmen on Calipari’s roster, had scored a total of nine points since the beginning of January, relegated to the bench after an early season illness. In this one, he got minutes that would have normally gone to the injured Willie Cauley-Stein, and finished with 10 points and eight rebounds. Eight of those points came on put-back dunks that were part of Kentucky’s 18 offensive rebounds. Harrison’s first three gave Kentucky a 58-55 lead and was part of an 11-0 run that made it 62-55 with 6:30 left. The Wolverines fought back, and during a nine-possession stretch of sublime basketball the teams traded scores. The next stop gave the Wolverines the ball with about a minute left, trailing 72-70. Stauskas missed a layup and a three-pointer, then Derrick Walton missed an open three. But the fourth attempt went in with 31 seconds left and got credited to Jordan Morgan on a scramble under the basket, though it was Randle’s hand that tipped the ball in. Calipari called a timeout. Michigan burned a foul. And the endgame started with 10 seconds left. The ball went to Harrison and it was clear he was going to take the shot. “In that stage, that atmosphere, that game, to make that shot and send us to the Final Four, it’s just amazing. I was proud of him and it was shocking at the same time,” Randle said. Randle finished with 16 points and 11 rebounds. He’s a Dallas kid and will play in the sport’s biggest spectacle not far from home. If that doesn’t feel like hitting the lottery, well, a few weeks later, he probably will. 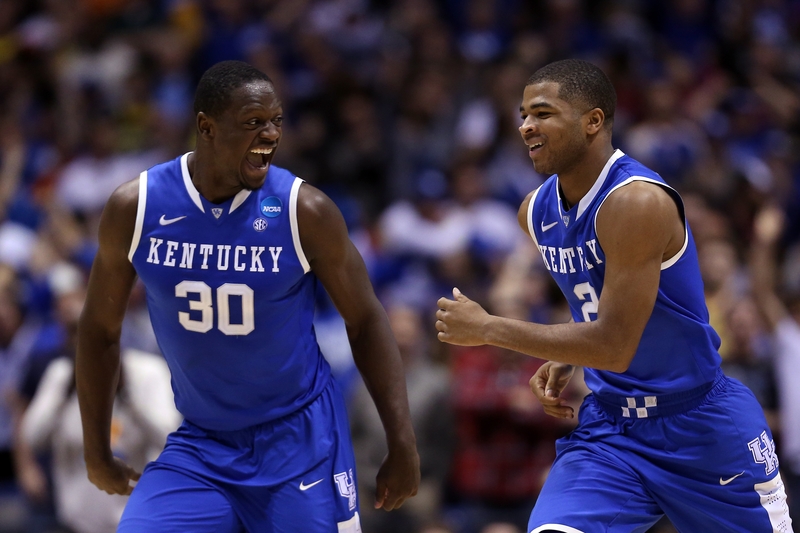 Randle is considered lottery pick material if he decides to go to the NBA, as expected. Others could join him in the Association, the latest group of one-and-done Wildcats that Calipari has put together. They’ll deal with that in 10 days or so.